Sunday greetings everyone, things have been a bit crazy around NYC recently, due to the freak snowstorm yesterday! 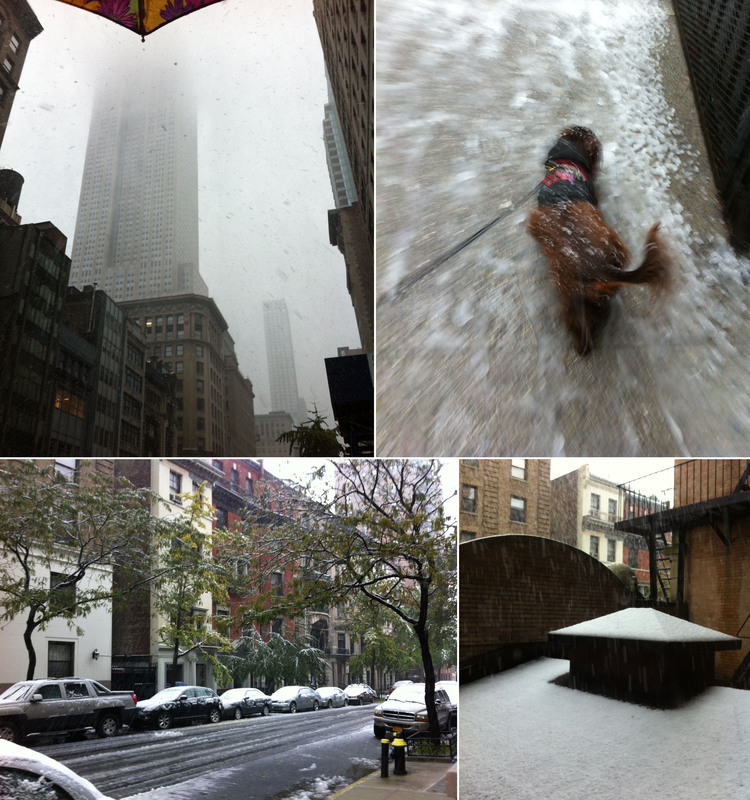 We may have crazy weather, but we’ve never had snow in October, and enough that it actually started sticking to things! I’ll include some photos of the snow at the end of this post, but for now I have a fun new project to show everyone. I thought while we were discussing drum shades I’d show you guys how the large version of my soda can tab light came out! 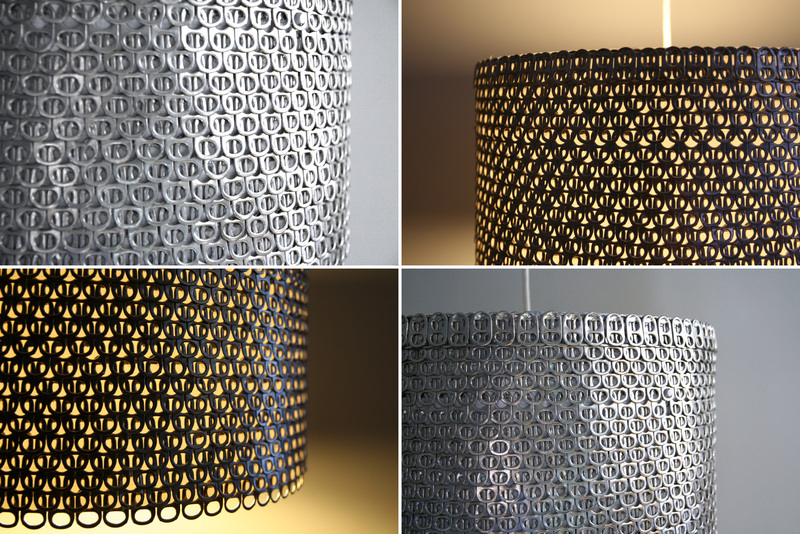 Recently I posted about my first foray into using soda can pop tabs for a light. I love this small size, and can totally see a string of them over a bar or kitchen counter. 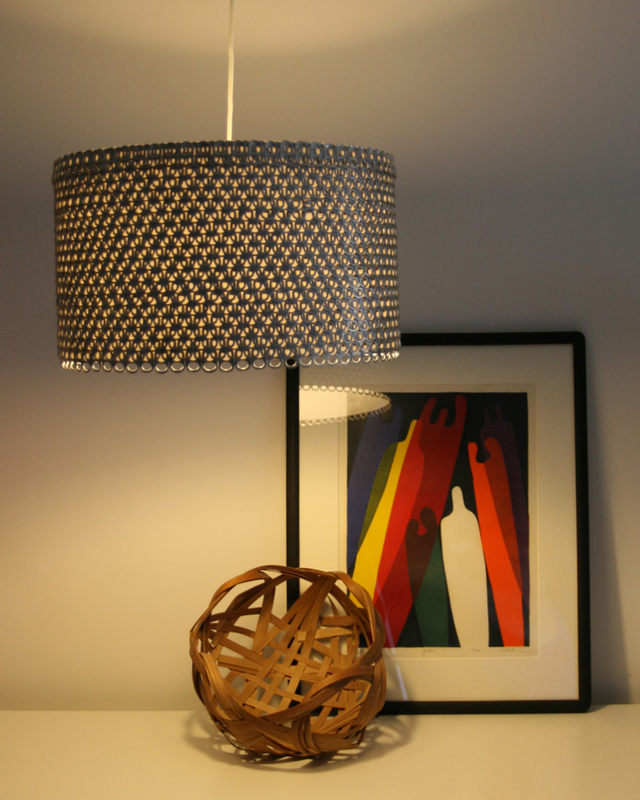 But, I had also really wanted to experiment with doing a much larger size, for a real statement piece, and something that would look fantastic over a table or as the main light in a room. So here it is, and I think (if its possible) I love it even more than the original small size!! 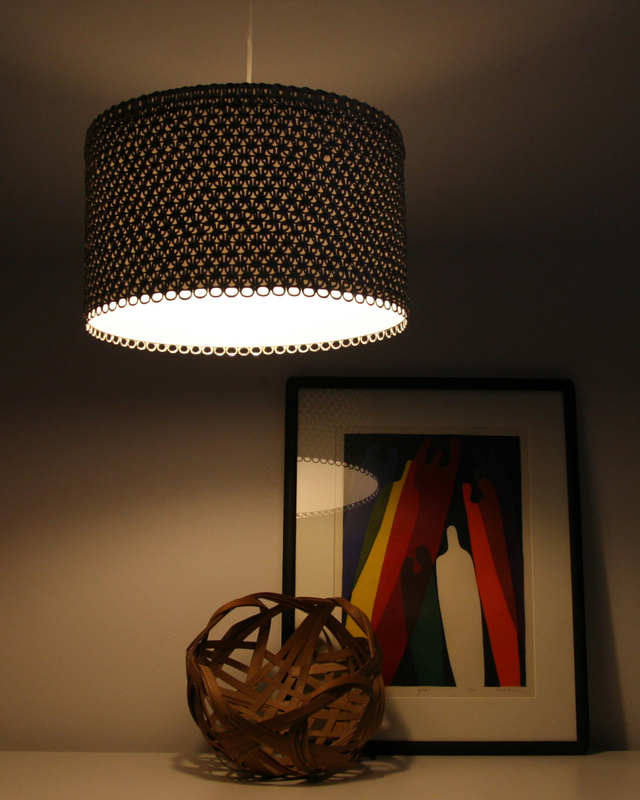 Overall the light is approximately 14 1/2 inches wide (diameter) and 9 inches tall. I used the same Lobbo shades, but this time I used the largest size they offer. However, the original shade is very square, its 14 wide by 13 high, and I wasn’t crazy about that aspect ratio. I really wanted a final light that was rectangular so that the width was really emphasized. So, I simply whipped out my Xacto blade and cut it down to a more appropriate height. (Though I made sure to measure the light fixture first and make sure that they light bulb would still be adequately covered by the shade.) Overall I’m really happy with these dimensions, I think it nicely captures the rectangular aspect ratio I was looking for, and I love how wide it is! Annoyingly, I’ve found it a bit difficult to photograph. I find all of these Soda Can Tab lights a bit tricky, but this one is even harder because it is so large and the detail is so small and almost finicky. Also the reflective qualities of the silver metal make lighting the shade quite difficult, and I’ve even had trouble with colored light from my TV reflecting off of the shade! I also have trouble with the lack of light in my apartment (especially now that we are entering the winter months and the sun is lower in the sky.) One day maybe I’ll have my own studio, with big windows and a place to set up a clean white backdrop, and a whole little setting with furnishings to give my lights nice context. Ah, a girl can dream can’t she? (Of course most girls probably dream of diamonds, I dream of real estate, I’m weird like that, its the architect in me I guess.) For now I’ll stick to my favorite set up with this fun colorful Japanese print and gorgeous Japanese basket. Overall this light used almost 1500 pop tops!! Personally I chose to glue them on with the light already assembled into the drum shape, but I sometimes wonder if I could have just as easily glued them on while it was still flat. I was worried that the curvature would do something funny to the pop tabs if they had been glued on while flat, so it was just easier not to risk it. It’s not too difficult gluing them on while the light is curved, but the whole process does take a LOT of time! I did this shade over a few different evenings, partly because I could only stand to glue on so many pop tabs at one time. But also just because of how long it took. I would estimate at LEAST 10 hours, possibly more. At least it is relatively mindless work and so I can watch movies, though I try to either choose something I’ve seen before or something I don’t care that much about because a project this detailed takes a lot of visual concentration, or you’re likely to glue the pop tabs on crooked, or even worse burn yourself! Hot glue is, of course, pretty hot but what I hadn’t realized before starting was how quickly it would conduct through the metal of the tabs! Its a bit tricky trying to glue something small into place when it starts getting too hot to handle. I found speed was essential, plus the ability to remove pieces if they were crooked. I’m going to try and post some more Art Around NYC posts soon, because I’d like to begin posting more frequently if I’m able to with my schedule. But, I also have a couple of other new projects in the works and some people might be excited to learn, they aren’t lights! That’s right, I am actually working on two new projects that aren’t lights. Well, one was supposed to be a light that sort of backfired, but the other project was never, ever, meant to be a light. Even I get sick of lights sometimes, and its always fun to try new things so I’m excited that I’ve finally had time to play around a bit and make some fun new projects for myself. Though don’t worry, I’m sure I’ll have plenty of new lights to show you all soon! In fact I might space out my new non-light projects a bit, for more variety. We’ll see how quickly I get things finished and photographed, and if the daylight in my apartment behaves. And now as promised, a few photos from yesterday, including one of Basel reluctantly braving the storm. He loves snow but hates slush because it just makes his paws all wet and cold, not to mention the rest of him that is so close to the ground! 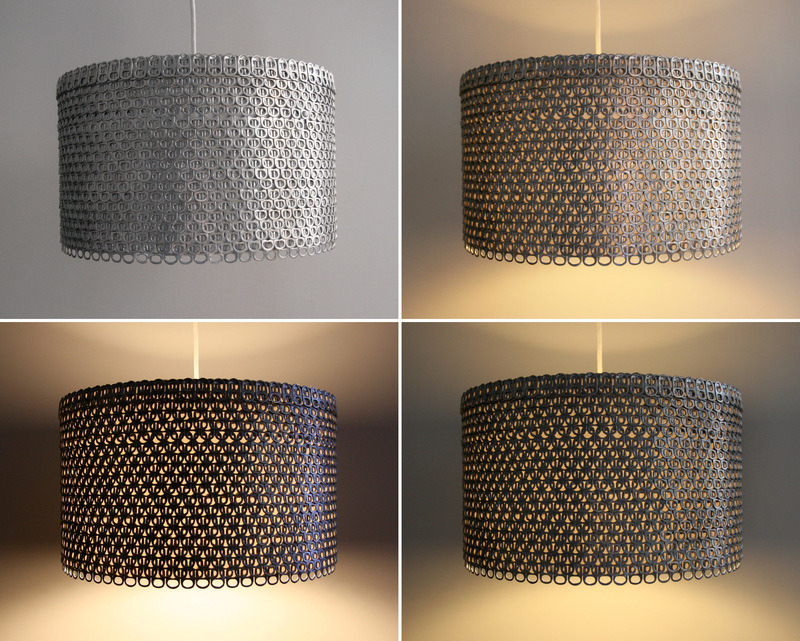 This entry was posted in Uncategorized and tagged cfl light bulbs, drum shade, eco-friendly, Etsy, lighting, pendant light, recycled, repurposed, silver, soda can pop tab. Bookmark the permalink. Stunning! I love the way the very bottom row hangs over the edge so just the circles show. do you sell these? can you ship to Australia- love, love, love it!!! Hi Kate, I do sell them and I can ship to Australia. 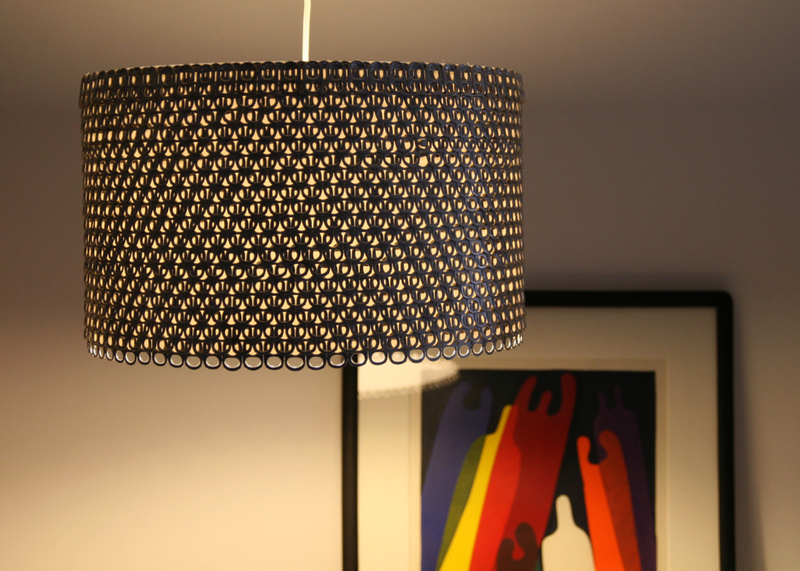 You can see all of the details in my Etsy store, the link is here: https://www.etsy.com/listing/83994160/soda-can-tab-drum-shade-large-eco Basically the shade is $450.00 and the shipping to Australia would be an additional $50.00. Production time would be approximately 6 weeks, plus 1-2 weeks for international shipping. If you are interested I can send you a Paypal invoice directly, so just send me an email at zipper8lighting@gmail.com and we can work something out. That’s a lot of tabs! Three and a half years ago I got a tutorial for a bag made with these tabs and I decided to save all the tabs of cans of soda consumed in my house for the project. At first my family would forget to save it but after awhile they got used to it. Now everyone knows they must save the tabs in the glass jar at the kithchen’s countertop . My husband tryed to throw them away several times but he is crazy, not stupid 🙂 – I’ve lost the tutorial for that bag and now I’m stuck with 4 cans of Folgers (33.9 oz) full of soda tabs. I also save the tabs from cat food cans, since they have the same shape and are just a little bigger than soI wonder how big is a pile of 1500 tabs.da cans tabs… and they have sort of golden color. Those are in a different container. I wonder how big is a pile of 1500 soda tabs. I never counted them. You think I have enough for this shade? Wow, that’s a lot of tabs. Honestly, I’m not sure whether you have enough or not, since I’ve never counted out 1500 either, or seen what exactly that looks like. But, I would say if you don’t have enough, you probably are close. All I can suggest is starting the shade and if you do find you run out hopefully its only with a row or two left and you can finish it as soon as you drink more soda. 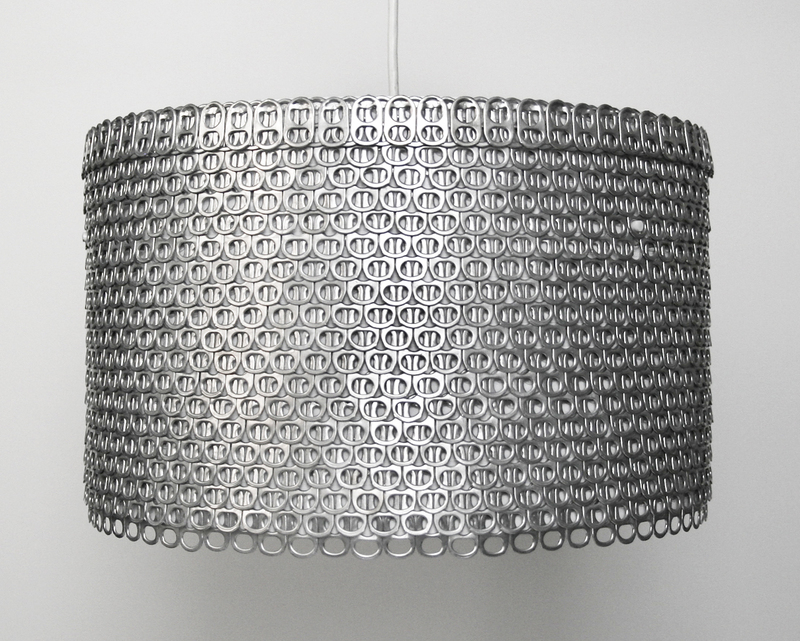 i want to know how to make one of these beer/soda tab lamp shades?